Goldens Are Here, by Andrew Furman. Green Writers Press. 364 pages. Trade paperback $21.95. There are so many strands and points of interest in this fine, highly original novel that it’s hard to know where to begin. In the background is the Cuban Missile Crisis, the blooming (technically and economically) of Florida’s Space Coast, and the Civil Rights struggle. In the foreground is the Florida citrus industry in the early 1960s as represented by a body of small grove owners along or near the Indian River. In these communities, the white folks own the groves and the black folks perform much of the labor. Race relations are in an uneasy truce, a tangle of old habits and shaky dependencies. A great freeze threatens to destroy the groves, even if insects don’t. The central character, Isaac Golden, has abandoned his career as a physician and set out on a grand adventure with his wife Melody and their two young children – Sarah and Eli. Moving away from the Philadelphia area, where their Jewish identity was readily reinforced, they have settled in a small town with only one other Jewish family and a considerable ride to Jewish institutions. The Goldens are clearly outsiders, and the way they are addressed by many of the townspeople carries a brand of politeness that barely veils a cultural tradition of anti-Semitism. Prof. Furman portrays how Isaac and Melody deal with their displacement and discomfort with skill and sensitivity. The story of Isaac’s attempt to develop improved breeds of oranges becomes a continuing lesson in citrus science. Prof. Furman provides a large specialized vocabulary that is the basis for reader understanding of Isaac’s mission and of the industry he has entered. This material and the extensive exposition should fall flat, but somehow the author makes it sing. He does this by capturing Isaac’s poetic passion, especially his interest in avoiding chemical pesticides and employing means of protecting his groves using natural, nontoxic agents. Well, he is spending more money than he is likely to make. Melody develops a roadside business selling from her vegetable garden, from the groves, and from the kitchen – her wonderful pies add much-needed income to the Goldens’ enterprise. . . . When you hear voices, is someone there? Flame Vine: His Voices, by Charles Porter. Privately published. 338 pages. Trade paperback $16.95. This, the s econd volume in Mr. Porter’s The Hearing Voices Series, is not like anything else I’ve come across in my many decades of avid book reading. Really! The author provides a truly original voice, a distinctive cast of characters, and an East-Central to Southern Florida landscape that sweeps upward from norther Palm Beach County, touching Wellington, Stuart, Belle Glade, and perhaps Mr. Porter’s home town of Loxahatchee. The narrative has the smell of the burning sugar cane fields up that way, and its characters engage with a lot of other substances that are turned to smoke or imbibed in some other way. The novel portrays the cultural scene of this swath of Florida as being in many ways representative of the U.S. during the second half of the 20th century. It opens in 1950 and takes us into the life of Aubrey Shallcross, his friends, and his resident voices through the early 1980s—when things change for the worse as an age of materialism seems to override an age that fostered various types of spirituality. Did I say “resident voices?” Well yes. Aubrey has been hearing voices since childhood, living with them, confiding in them, even learning from them. The primary voice, capable of positive influence, is Triple Suiter, affectionately called Trip. Other voices – or presences – are Amper Sand and a darker presence called Slim Hand. Traditional psychiatric medicine would call Aubrey’s condition schizophrenia, but Charles Porter is wary of this label to the point of suggesting that no treatment need be recommended. Aubrey is a fully functioning individual whose unconventional, unwilled, capacities extend rather than limit his sense of the world and his humanity. He is a member of a community that not only tolerates him but finds him to be a steadying anchor. The gang that meets at the Blue Goose for nourishment and alcoholic refreshments – and every kind of narcotic – is a group given to excess. While some, like murdering vigilante Sonny, who stuffs his dead victims in refrigerators, are truly over the top, they are nonetheless reasonably loyal to one another. . . .
Simon & Schuster. 368 pages. Hardcover $30.00. Recounting the ways the ancient faith redefined itself in the 18th- and 19th-century United States. Was he making a joke? Didn’t he know that the questioner wanted to know if he was Orthodox, Conservative, Reform, Reconstructionist, Hasidic, or some other variation of the religious spectrum? Of course, he knew. It was a serious answer, but with a bit of a wink. 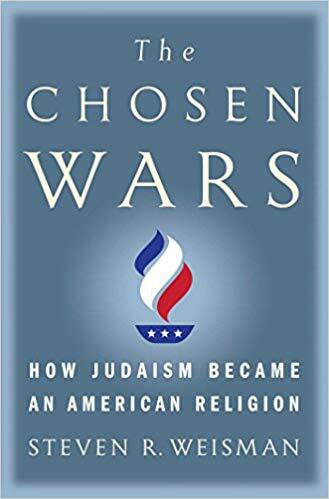 The story that Steven R. Weisman tells in The Chosen Wars is, among other things, the story of the search for a unified Judaism responsive to time and place and seeking to be confident about a Jewish future. It’s the story of growing opportunities for Jews to enter cultural mainstreams and the costs and consequences of admission. It is a story told with power and precision. After sketching the earliest arrivals of Jews in New Amsterdam (1654) and examining Jewish life in the Colonial period, Weisman explores the peaks and valleys of migration — most often peaks — that occurred in the 18th and 19th centuries. He details the early prominence of Charleston, South Carolina, as a place where immigrant Jews could build a vibrant community. He examines the interplay between becoming an American with almost unimaginable rights and holding on to the traditional responsibilities of Jewish life as it had existed in past centuries. Along the way, Weisman explores the vying strands of Ashkenazi and Sephardic Jewish culture. Part of the process of fitting in had to do with imitating what Americans expected in houses of worship. To that end, many synagogues echoed the grandeur of churches, particularly Presbyterian churches. But how did Jews make the transition from various corners of Europe, where they were so often victims of persecution, to an unaccustomed security and even prominence in the land of the free? Weisman presents the saga in its many parts, drawing on a series of fascinating characters and stressful crises. . . .